THE CHILLLNGTON TOOL CO., LTD.
COSSUL & CO. PVT., LTD.
LASHER TOOLS (PTY ), LTD. THE TATA IRON fc STEEL CO., LTD.
W. TYZACK SONS & TURNER, LTD.
WOLF TOOLS FOR GARDEN Sc LAWN, LTD.
Used to scarify the top layer of soil, the Garden Weasel is comprised of three pairs of eight-pronged metal wheels. The wheels are removable, and the unit may be used with one, two, or three sets for cultivating different-sized rows. 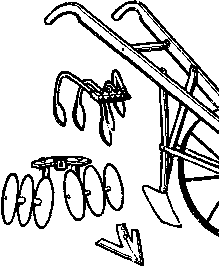 The wheel hoe with (lop to bottom): shovel, five-pronged weeder, disc cultivator, and sweep. 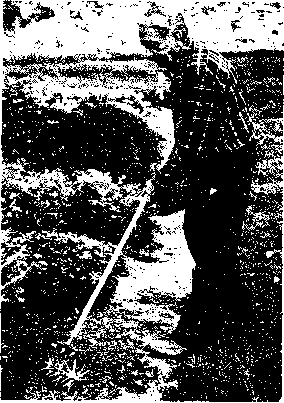 elude: (1) the turn shovel or moldboard plow; (2) reversible shovel and (3) five-pronged weeder. Many other variations are available. Rob Johnston finds the six-inch-long blades to be the most useful attachment when caring for his vegetables. They run just below 'he soil surface as the hoe is pushed along ancl weed very close to small plants without throwing soil on tho'si. Supporting the attachments is a metal, tubular, or wooden frame witli either a small or large wheel. The larger wheel makes pushing a bit easier, but a small wheel offers better control over the cultivating attachments. Most units have a straight handle frame bolted to the wheel. However, the overshot frame is advertised as being easier to push. The wheel hoe is best put to work in the early stages of weed growth. It can be used for a continuous operation if one person pulls by rope while another pushes, but is most often pushed about two feet, pulled back, and pushed another two feet. single-wheel hut's will do all that the two-wheel models do except straddle tall (over eight or ten inches) plants, especially t'.e erect plants like torn, reports Rob Johnston. 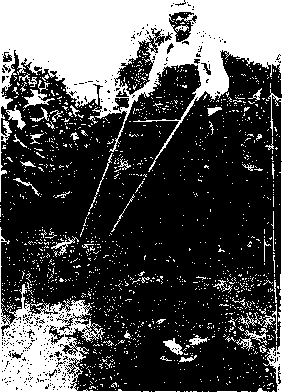 "To straddle a row with the single-wheel hoe, the wheel is mounted to one side of (he frame, instead of on center, and cultivating tools till each side." When using wheel hoes for cultivation, rows may be sown as close as ten inches apart, showing a clear advantage over knouts which depend on a tiller for cultivation, necessitating wasteful, wide row spacing. Care and maintenance are two important factors in determining the longevity and performance of any tool. It is important to remember the blade of a hand tool is its most important part. When purchasing a hand tool for cultivation, make sure that the blade is made of carbon or high-carbon steel so that it remains sharp and does not wear out quickly. It is important to keep the cutting edge of the blade sharp; otherwise too much power will be required to work it, and both the quality and total work done in a day will be reduced. The blade should be cleaned after use and a bit of grease applied to the cutting edge before storing. Tom Ulicit has spent many long hours using a wheel hoe on his small farm. He writes, "If 1 had to choose a single cultivating tool in addition to a hoe, it would surely be the Planet Junior No. 37 Wheel Hoe, These; units are easily serviced and extremely durable. 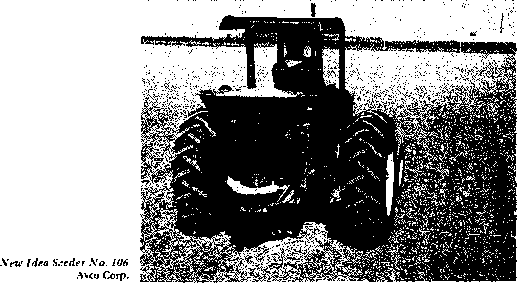 They may be used to cultivate any crop in row widths front eight incites on tip. They work well on just about any type of good garden soil, and their ease, speed, and accuracy of operation are remarkable. A person in reasonably good physical condition can cultivate faster and more accurately with one of these hoes than with any rotary tiller I have ever seen. (I have cultivated an acre of crops in less than four hours with one of these hoes.) Furthermore, wheel hoes are about the most environmentally sound means of cultivating, besides being an excellent form of exercise. Everyone here on the farm finds using a wheel hoe extremely satisfying and pleasurable—even the children like it." The, Planet Junior Xo. ¡7 Wheel Hoe: The low wheel is more difficult to push but offers more control over the cultivating attachment.